Over the past 15 years, Allstar Tiling has firmly established itself as the premier wall and floor tiling contractor of choice in Ireland and the UK, providing professional commercial solutions to a who’s who of main contractors. Building Ireland travelled to Thurles, County Tipperary and touched base with commercial manager Seanie Fogarty to find out more about this industry-leading business. With a decade-and-a-half’s experience in delivering professional tiling services throughout Ireland and UK, Allstar Tiling is synonymous with providing first class, quality assured workmanship on all projects undertaken. Attention to detail and value for money are the hallmarks of the specialist tiling contracting service offered and Allstar Tiling has quickly become the tiling contractors of choice for building industry professionals, including main contractors, developers, architects and designers, providing solutions that are fast, efficient and designed to exceed client expectations. Due to the high quality of the solutions provided, Allstar Tiling benefits from a large volume of repeat business and positive client referrals, a selection of the many projects completed including Double Tree Hilton Hotel Glasgow, Jurys Inns in the UK and Ireland, Aghadoe Heights Hotel Kerry, O’Keefe Kia Red Cube Tipperary, Holiday Inn Express Dublin, Talbot Hotel Dublin, Carlton Hotel Edinburgh, Ibis Styles Hotel Manchester, Dylan Hotel Dublin and Jamboree Foodfest & Bar in Manchester as well as Starbucks, Land Rover and Jaguar, the Morgan Hotel, Dublin and the landmark Bewley’s on Grafton Street, while Allstar are currently engaged on Center Parcs in Longford for John Sisk & Son, amongst others. A limited company since 2015, Allstar Tiling is owned and managed by founders David and Ryan Fogarty alongside Ryan’s brother, Seanie. “We’re supply-and-fit tiling contractors, specialising mainly in commercial projects as well as a small bit of residential work,” the latter reveals. At the time of writing, Allstar Tiling were live on site with the aforementioned John Sisk & Son, John Paul Construction, PJ Hegarty & Sons, Collen Construction, JJ Rhatigan and Edgewater Contracts. 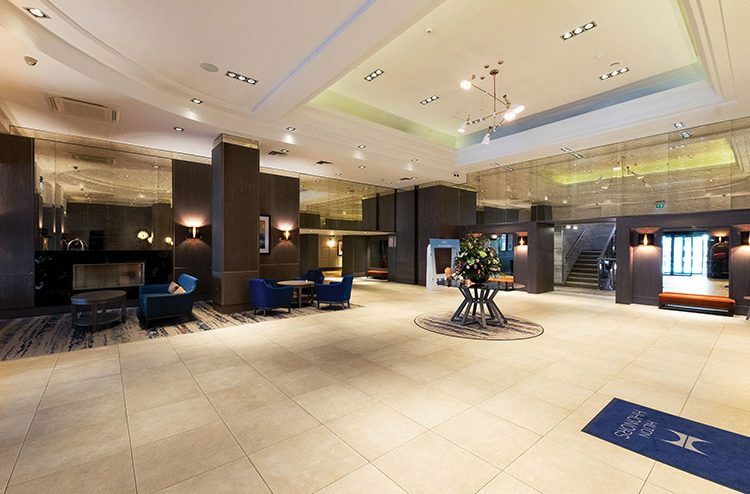 Over the years, their excellent project management skills and ability to deliver superior solutions at competitive rates have seen them successfully win tenders for several large- and small-scale specialist tiling projects, including numerous hotel, office block and leisure centre refurbishment contracts. From fit-outs to intricate designed layouts, Allstar Tiling has worked on all types of projects for all the leading construction firms in Ireland and the UK, their in-depth knowledge of their chosen area of expertise allowing them to work closely with leading suppliers and manufacturers to source the highest quality tiling products. Hotels are very much the company’s bread and butter and some of these include countless Marriott Hotels and Maldron Hotels as well as, in recent times, the Clayton Hotels in Ballsbridge and Dublin Airport, to namedrop a handful. Regarding the essential qualities and attributes that have enabled Allstar Tiling to develop into such a highly sought after commercial tiling contractor, Seanie states: “First of all, we are a supply-and-fit contractor and there are not too many who are prepared to offer both services on large and complex projects. Allstar Tiling possess the skills and expertise to work across a broad range of sectors including hotels, bars, restaurants, airports, apartment blocks, leisure centres, hospitals, nursing homes, guest houses, government buildings, shopping centres, schools and private dwellings. They are proven specialists in all modern tiling styles and techniques, and every project is completed to the highest standards to even the tightest of deadlines. Top-class finishing is a prerequisite so that all tiles fitted – be they porcelain, ceramic, marble, mosaic or limestone – will perform and last for as long as possible, while remaining easily maintainable. With up to 30 men on site at any given time, Allstar Tiling work hand in hand with project architects to source and fit the exact finish specified. The company is renowned as one of Ireland’s leading supply-and-fit tiling contractors and further growth is a distinct possibility.